Saturday was the last day for Primitives of the Midwest. Stacy West of Buttermilk Basin, another designer whose work I've long admired. This workshop really emphasized to me the range of design styles that you can find in primitive crafting. I love Maggie Bononomi's work and the very vintage feel of her designs. But I'm also drawn to designs with more detail like Lisa Bongean's and Stacy's and this penny Christmas tree has lots of that! Stacy also recommends using Stem a Seam to ensure your applique has crisp edges and because it gives a strong enough bond that you can pack it up and take it with you to sew on the road or as you're waiting for kids, etc. Stacy also demonstrated another method of blanket stitching. Stacy begins her stitch at the edge of the design which allows her to see exactly where that stitch will come up in the design, looping through the thread on the topside and pulling it taut but not too tight. Stacy used regular DMC floss for this design and the large selection of colors would make it easy to pick one that would blend nicely with whatever you're sewing, if you don't want your stitches to show prominently as part of the design. Some of you have asked for more information on Lynda Hall's crazy wool method and this tutorial from Kaaren on The Painted Quilt demonstrates it much better than I could. Her stitches are just beautiful! For me personally, however, I'm beginning to rethink whether it would be easier to do the stitching before adding the applique. While it would mean more stitching, at least for a beginner like me it might help to make the stitching look a little better and more uniform. As you can imagine, the end of the workshop gave me the same feeling of loss I get when I finish a book that I loved reading. But I'm also coming away with a new enthusiasm and appreciation for wool applique and am so fortunate to have shared a little time with such kind, talented and fun teachers and professionals. Yesterday my friend Barbie Jo of Cleo and Me and I had the privilege of participating in Lynda Hall's crazy wool pincushion class. I haven't made any crazy wool projects before, so this was another new technique for me. Lynda explained the techniques and demonstrated some of the decorative stitches and away we went. Some of her samples were made by her granddaughters. Wouldn't that be a fun project with your grandkids! We were encouraged to be creative and draw our own designs and Lynda also had several pattern sheets with additional ideas. We received a kit with a variety of wool which we used to piece our background and baste in place. After the background is in place, you can either do the decorative stitching or stitch your applique. We received a kit with a variety of wool which we used to piece our background and baste in place. 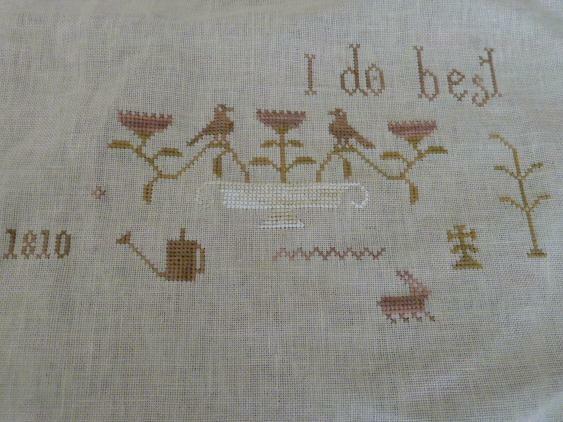 After the background is in place, you can either do the decorative stitching or stitch your applique. 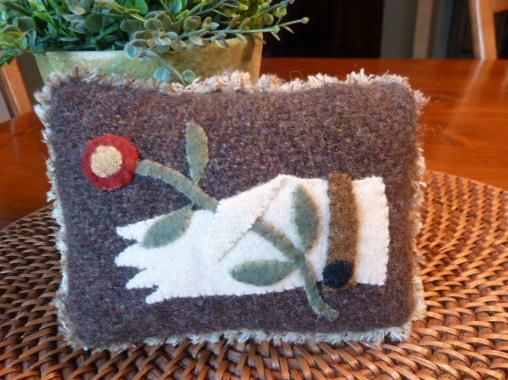 What a great way to use up those little random scraps of wool! Yesterday I had the privilege to take part in a class at an annual gathering of superb primitive artisans in nearby Lee's Summit, MO called Primitives of the Midwest. I took an all day class offered by Lisa Bongean of Primitive Gatherings. Lisa keeps the class moving, but she has a lot of great tips and different ways to do things. 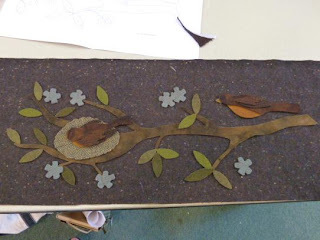 Lisa's designs have a lot of detail and she's developed some new techniques to ensure that her finished project has the well crafted look she wants. Instead of using freezer paper to cut out the pieces and tack them on with glue or pins, Lisa recommends using Seam a Seam Lite. Lots of Cutting Out to Do! I've always used the freezer paper method and the benefit is you don't have to trace everything. For example, this design has seven flowers and I had to trace each one of them. Using freezer paper allows you to trace it once, cut out the design and then you can reuse the paper and even save it to use when and if you make that design again. But one advantage to using Steam a Seam is that, if you're using a piece of wool that frays easily, this will cut down on the fraying. Lisa also recommends running a tiny bead of Fray Check on the edges of loosely woven wool to ensure no fraying! Lisa also has a different way of doing the blanket stitch. The trick to ensure the stitches lie flat and don't roll over the design is to keep pressure on the thread, pulling it back from the design. I've done a lot of blanket stitching and never figured that out, but it does make a difference. And then to finish, Lisa cuts the backing about 3/8" smaller than the design, pins the pieces together RST and edges matching and stitches around, leaving an opening for turning this piece. This will cause part of the wool background to roll under, making a nice clean edge that doesn't need to be blanket stitched unless you want to do so. There's a lot of stitching involved, but I hope to finish this up this weekend. If you are a fan of Lisa's, you'll love the BOM she has coming out this fall. It's a take on the classic Baltimore Album quilt done in wool. I'd love to do this, but I'd have to make it a wall hanging. It would probably last only one or two days on the bed before one of the cats would throw up on it. I'm cleaning out some of my crafting stash and would love to find a new home for some lovely, Bethany Lowe tissue paper garlands. I bought them several years ago and ever since they've been stored away in a bin, never to be used. I don't want it to go to waste for another year, so if you can use this I'd love to send it to you. I'm not charging for the tissue, but would appreciate being reimbursed for the postage. I have four 9 foot garlands. Please email me and this will be first come, first served. THANK YOU! ALL THE GARLAND HAS BEEN SPOKEN FOR. Also, want to alert you about a wonderful giveaway at The Primitive Hutch. Robin has a very sweet gardening doll that she will be giving away on July 1, so be sure to hop on over to her blog and register to win! Hope you had a wonderful Father's Day weekend. We are empty nesters again until August since Mark left for orchestra and trumpet camps Sunday. Although when you're older these are no longer called "camps"--now they titled with less recreational sounding names like "festivals" and "seminars". I managed to complete one of my WIP's; a small penny rug mat in rustic colors. I finished my stitching last night as I was watching the PBS American Experience series on the Lincolns, which I highly recommend. The rabbits were also busy this weekend, chomping away on my newly planted blue fescue grass. Our gardens are edged in limestone and I like to soften the edging with draping greenery, but it looks like it may be a challenge to keep the rabbits out of this grass. 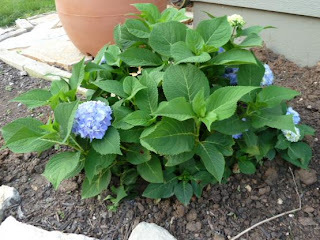 I'm going to try putting cat fur around the plant, since I have a ready and abundant supply of that and have heard the scent might detract the rabbits. I'll let you know how that goes. Luckily, the plants on my deck have escaped the hungry rabbits. I am really drawn to gardening designs this month. Here's the items I'm offering for sale on this month's Simply Primitives. I have three little pillows, all made from JoAnn Mulally designs. 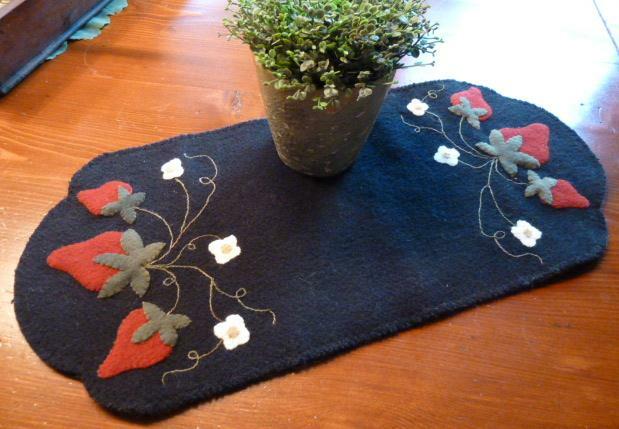 They're wool applique backed with coordinating quilt fabric and edged with hand dyed chenille. And here's the Strawberry Trio mat from a Primitive Gatherings design. I gave a close-up peek at this in a previous posting. I love the color of the strawberries. I tend to buy brownish-red wool so I had to look for some that had more of a strawberry color and I'm happy with what I found! I will be busily stitching away this summer. Out of the blue I received a call from the organizer of Handcrafters, a wonderful local show. This is one of those shows where people are lined up to get in the door and the vendors are closely screened to make sure they're offering truly hand crafted items. I'm really excited about this opportunity, but it will mean cranking up the production schedule and switching my focus from the garden to fall and Christmas. Hmmm, maybe a gardening witch? Have you ever done this? I went on a garden tour hosted by our local Master Gardener's program this past weekend. We've gone before and the gardens are so inspiring--it's so interesting to see how everyone expresses themselves in their garden. I took my camera to capture the unique elements and great plant combinations of the gardens, but to my chagrin found that I had left the battery at home in the recharger! The houses on the tour were too far from home for me to return home and get the battery. I'll definitely check to be sure I have the battery next time or keep a spare in the case! We did work in the garden a lot this weekend and when I wasn't gardening I was working on sampler appropriate to this time of year. I bought this Brenda Gervais pattern about a year ago because of the sampler. I wasn't sure I'd like the muted colors. I've never worked with Weeks Dye Works threads before and at first it seemed like you couldn't tell the difference between the various colors, but they're growing on me and I really like the faded appearance. I'm a lover of cookbooks and cooking magazines. My favorites shift over the years and I purge my collection from time to time, but I've held on to many of the Pillsbury Classic Cookbooks that I purchased and often refer to them for new recipes. I've made this fruit salad for two recent events and people have asked for the recipe at both, so it's a winner in my book. It's simple, healthy and yummy and you might want to try it this summer. Meanwhile combine all dressing ingredients in a small bowl and blend well. Layer fruit in glass bowl. When ready to serve, pour dressing over fruit and top with toasted coconut. The second time I made this I was short on time so I just purchased a fruit bowl from Costco and made the topping. Here is Kansas the weather pendulum has swung from cool, rainy spring to oppressively hot and dry. It's a challenge keeping up with the watering but it is relaxing to wander around the yard with a watering can late in the day when the humidity is down. Hope you're enjoying your summer! Seems like the summer weather is finally settling in here and I'm focusing on summer themed items as I craft. 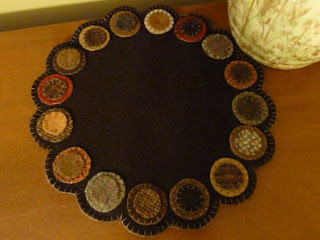 Here's a peek at the wool runner I'll be offering on the next Simply Primitives. I enjoyed stitching the little curlicue vines! 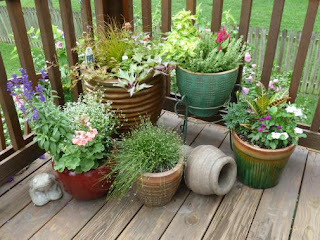 I spent some time in the garden, planting flowers and rearranging plants. The hostas next to the house thrive while those in the back of the yard suffer from too much sun and rabbit invasions, so we moved them to hopefully safer and more suitable ground. Hostas seem to take moving and dividing really well. A couple of these plants even came from a yard sale! As I've mentioned before, I'm a big fan of foilage plants and I think the hosta's various shades of green and variegated foilage mix well together and have a peaceful, calming feeling, so what could go better than an angel birdfeeder, also in green.